Willie Cole constructs his assemblage sculptures from found domestic objects and imbues them with spiritual, and often mythical, power through allusion and metaphor. Since the mid-1980’s, he has been preoccupied with the steam iron as a domestic, symbolic and artistic object. 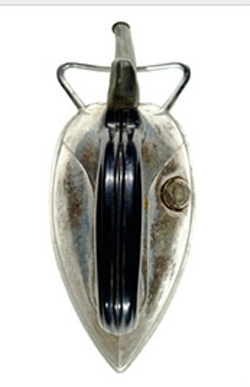 Cole first assembled used irons into iconic figurative forms reminiscent of African Art. In exploring ways to infuse these unpretentious figures with the potency of their progenitors, he discovered the scorch. 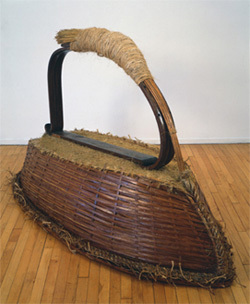 The first scorches date from 1988-89, the year Mr. Cole spent as artist-in-residence at The Studio Museum in Harlem. Early works incorporate the iron in both sculptural and printed components – an actual iron’s presence and evidence. Later, he began appreciating the beauty of the iron surfaces, and discovered that every brand of iron had a different face. 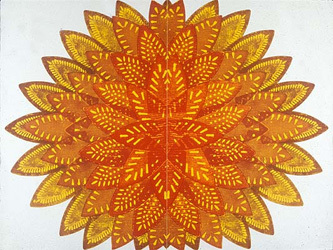 In Sunflower (1994), Cole united the decorative potential of his scorching with a powerful and evocative form. 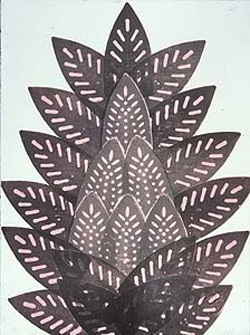 Recently, Cole has employed the iron within the printmaking medium of woodcut. Cole uses the branding process to draw out what he calls the spirit in the object. The smell, the texture, and the searing physical act all contribute aspects of meaning to his unique approach to imprinting an image. The scorch also embodies personal experiences from Cole’s African-American background and reflects the creativity with which he asserts that heritage. While Cole has also done work with shoes, hairdryers and other “domestic” objects as their subjects, the iron is pervasive. What do you think about narrowing your focus as an artist and exploring as many permutations of an image as possible? Would you be able to follow an iconic image for years to see where it would lead you? What types of images could you see yourself following? Just saw his latest when the Met included his work in an installation called “Provocative Visions” from permanent collection of the Museum. It opened in September of ’08 and was supposed to close on 3/8/09, but it has been extended until the 22 of March. 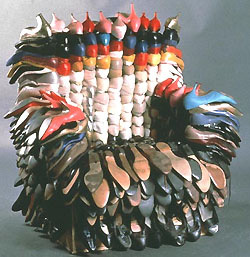 I so wish it to be seen because it included Cole’s “Shine” – a most amazing scupture created from women’s black pumps? And one of his Iron pieces are also there and one of his bicycle sculptures. What a genius. I also believe I saw some of his work some years ago at the Newark Museum which, by the way, is a very unsung and wonderful art museum that has been part of Newark NJ’s cultural history for many, many years. In these hard, hard times, it is amazing how artists help us to calm down and remain civilized. Amazing! I agree – wonderful post! The “soul of the object” had escaped me until I saw this body of works. What is the contact information for Mr. Cole? Jane, great post and incredibly fascinating work. All the more exciting being done in such a common,omnipresent object. For my two cents, I would love to find something iconic that I could explore exclusively. The leaf quilts have long been a focus but I have never taken them to the level of Cole’s. Again, interesting food for thought. Jane- thanks for this post- I have seen some of his work and was enthralled way-back-when, but he had sort of oozed out of my consciousness. Nice to see what he’s has been up to. Very interesting! His work was brought up on an Assemblage list I belong to. One of his recent shows was entitled “Anxious Objects”, a term coined by critic Harold Rosenberg to describe his contention those contemporary artists who “create hybrid objects with strong and unsettling cultural implications and energy”. 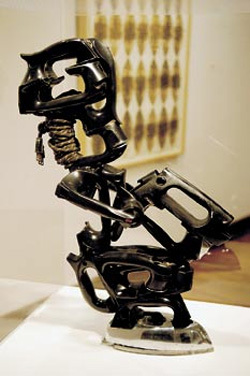 Cole’s irons referencing African art certainly offer strong cultural implications. My husband and I collect African art, particularly from Cote d’Ivoire, Mali and Congo, and the visual connection is clear with Cole’s iron sculptures and masks. I find his work to be very powerful and the raw materials (the irons) add that surprising element that takes both the medium and the message (the finished pieces) farther than they might have gone alone. I think the iron itself used in the sculptures and used as a printing device is pretty ingenious. That’s really exploring an icon. I’ve been trying to think of other images/icons that would prove as versatile. I find myself drawn to the same imagery repeatedly and although I both paint, collage, and stamp fish and print with replica fish I would consider what I do as nearly pushed enough yet in my fish exploration. I wonder what would happen if we were each forced to tackle one image, in every possible, imaginable permutation for a year? It would be very, very focusing, but I don’t think I’d be willing to submit to such a challenge. Fabulous — and like Terry, I didn’t know of Willie Cole. And there’s the Tillie Olson short story “I Stand Here Ironing” that is a wonder of a tale for mothers and daughters. I tend to work on single images until I feel like I’ve milked them for all I can get out of them — dragons and crows, and more recently, cars. Go figure. Also, of course, pine trees and trees of all sorts. I do get obsessive about specific images, but never in as marvelous a manner as Cole. I find that there are always stuck places where I can’t imagine (and don’t want to imagine) what more an image could do for me, but if I persevere and push through the stuck place, the rewards are great. Cole has obviously pushed, and pushed, and pushed. Jane, you always find such fascinating work and nearly always someone I had never heard of. I am quite enthralled by Willie Cole’s irons. There is something very reminiscent of African masks and art in that shape, which I had never noticed before, making the work truly more iconic than kitschy cleverness. There are images I keep returning to, like crows and other birds, and faces and hats and scissors, and beetles, but not so much as exploration. Scissors might be an image/object I could work with in this way. I wonder, though, if I could follow it for years.